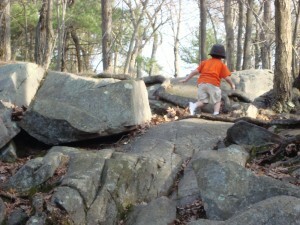 The family celebrated the first day of Spring by hiking a “hard trail”. Sweet Coco got left in the dust by his older brothers, (You see that tiny speck of blue by his arm? That’s Tremendo’s hat.) but he didn’t give up. He was determined to keep up with them. He passed out right after dinner. 10 Responses to "Straight out of the Camera Saturday: He’s a trooper." I love how he still is running to catch-up, and determined not to give up. ah…what a trooper! that really looks like a hard trail…I love his short legs and his hat is definitely a trooper hat…have a good weekend! Thanks for stopping by, Lisa and Donna. Awww, what a brave little guy! I would have been asleep after dinner too! LOL! Thanks for paying a visit, Carrie. Ah, how great that he kept at it. Isn’t it wonderful when they’ve had a day that they loved, gave it their all and then zoink out?